Today was our last day on the rail pass and we used it to make the trip up to Yamanouchi (山ノ内 = Mountain + ‘s + Inside) near Nagano, to visit the famous hot spring bathing snow monkeys at the Jigokudani (地獄谷= Land + Jail + Valley) Monkey Park. Since it's quite a long trip to Yamanouchi from Tokyo, and we wanted to squeeze in a trip to Washinomiya Shrine in Saitama on the way back, we made sure to book an early 7:24am shinkansen to Nagano the day before. This particular train also allowed us to quickly transfer to a bus at Nagano station that would take us to a bus stop near the Monkey Park. 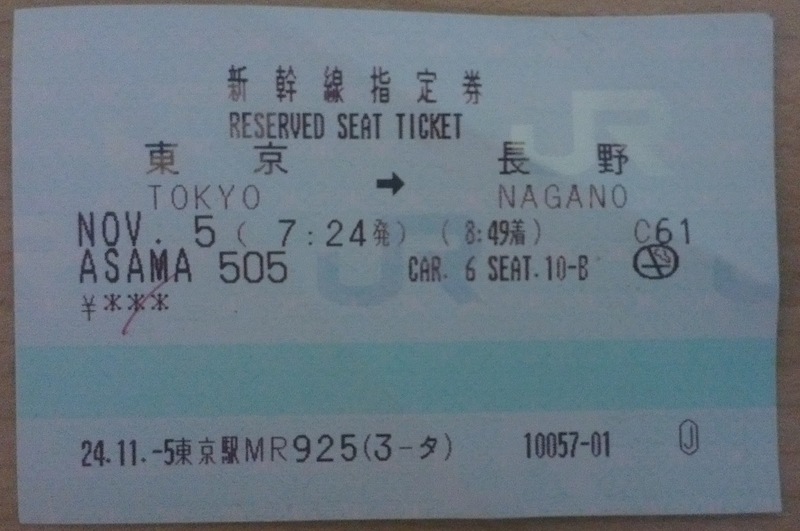 After waking up and getting ready in the morning, we caught a train from Hatchōbori to Tokyo, made the long transfer to the shinkansen (this was getting old fast), boarded our train, and arrived in Nagano one hour and twenty five minutes later at 08:49am. Our bus left at 9:10am and although we had a little bit of time to spare we wanted make sure we found where it left from first. Nagano Station had a lot of different exits and most of them seemed to have a bus stop at them, so we were a bit unsure about what one to go to. Thankfully though, I knew the bus we needed was bound for Shiga Kōgen (志賀高原 = Intention + Congratulations + High + Field) and since the signs for the different bus stops had destinations in Japanese I was able to recognise which one we needed. While I remember that it was one of the east exits, I'm not entirely sure which particular one it was. Once we arrived we found that the bus was already there waiting and I confirmed with the driver that it would be going to the Kanbayashi Onsen-Guchi (上林温泉口 = Above + Forest + Hot + Spring + Mouth) stop. I also asked about tickets and he said we'd be able to simply pay when we got off. We decided to hang around outside the bus stop and hopped on when it was nearly time to leave, and a few minutes later we departed. We travelled through the city of Nagano on the way to the expressway and at one point passed the M-Wave building which is a former speed skating Olympic venue (Nagano hosted the 1998 winter Olympics). It's now a museum and is quite an interesting looking building. The bus trip was fairly long, taking a total of forty one minutes until we reached our destination. It was pretty smooth though and the time went by pretty quickly, Kate actually even fell asleep once we hit the expressway! Luckily I stayed awake; otherwise we may have missed our stop! Out of the windows the big mountain ranges that make up the Japanese Alps were visible. The mountains were snow capped and very pretty to look at. As soon as I heard the announcement for our stop I pushed the button to indicate that we wanted to get off and we pulled over at our bus stop a short while later. Apart from us two other people got off as well. They didn't seem to be able to speak any Japanese and only limited English and were trying to ask the driver (in English) where to get the bus to get back, the driver pointed out the bus stop on the other side of the road. It was pretty clearly a bus stop and seemed a bit obvious to us that that's where you'd get it from. Maybe they just wanted to be sure. Right next to the bus stop there was a map that indicated how to get to the path that led to the monkey park. We had a quick look and set off! The other people who got off with us spent a very long time looking at the map. I thought they'd follow us as we were clearly going to the same place anyway. It’s possible they wanted to walk by themselves though and were just waiting for us to leave. The start of the path was clearly marked by a big sign with pictures of monkeys. The rest of the general area was fairly residential although next to the path entrance there was a ramen shop, a few parked tour buses and a sign stating what to say when calling a taxi (in English). There was also a nice big tree that had exploded into vibrant autumn colours of orange and red. After taking a quick photo of the tree we set off down the path on the approximately half an hour long walk to the monkey park, the trail wound through the forest and it was quite a pleasant walk. Along the way there were a number of signs that either warned about snakes or gave some interesting facts about the monkeys as well as the other animals that lived in the area. At one point we were surprised to be passed by a little truck. The path was very narrow and had a long drop on one side so it was a tight fit but I guess it beats carrying everything in and out. When we were about half way along we started to encounter people walking back the other way. Since we had heard that the monkeys did not always visit the park and sometimes stayed up in the mountains we tried to work out if everyone’s faces looked satisfied or disappointed. We thought that since they were heading back so early the monkeys were probably there! Unless they were heading back because the monkeys left of course! At another point along the path I managed to somehow twist my ankle pretty badly. The ground wasn't particularly rough and I didn't fall over but it still hurt a lot. I actually managed to hurt it enough such that it was still sore around two months later. It wasn't bad enough though that I wasn’t able to limp the rest of the way there and all the way back. Once we finally arrived we found that the path opened up into a small valley that had a little stream flowing down the middle. There were a few shantily built old buildings about the place and a bit of haphazard style construction around the stream. I think one of the buildings was a shop or a restaurant although it wasn't open when we arrived, probably since it was still pretty early. The hot spring pool where the monkeys hang out was located a bit further into the valley and we followed signs across to a path that led up and along one the side of one of the hills. Right before we went up the path we came across a vent that was expelling a massive amount of steam! The geyser was coming up out of a pipe that captured underground steam. I think that it was built like this with a pipe in order to help control where exactly the steam comes out- otherwise it might just pop up in random locations. After we climbed the stairs we came across our first monkey! He was hanging out on the side of the path! Some people were getting really excited about it and we did too! After saying goodbye to that first monkey we continued on and eventually reached the entrance to the hot spring pool. We found that this area was separated from everywhere else using geology, a fence and a building that let people pass through to where the monkeys were. "Just hurry up and get it over with, ugh"
The fence and building were not to keep the monkeys in, as the park is not a zoo and the monkeys are free to come and go as they please. The fence was just to stop people wandering in without paying. At the building there were a number of small lockers that you could leave your bags in free of charge and I used one of them to store my backpack and jacket. We then paid the 500 yen entrance fee and went in. At the hot spring area we found heaps of monkeys!!! Many of them were bathing in the hot spring which was hot enough to be giving off steam. Outside of the pool there were even more monkeys around! The main activity the monkeys were engaged with when we arrived was searching though each other’s fur for bugs which they would then eat. The bug picking monkeys all seemed pretty engaged with their task. Of the pickees though, some appeared to be enjoying the process much more than others! "This guy... It's like 'good grief' you know?" Apart for the many adult monkeys there were also a fairly large amount of little baby monkeys who were being looked after by the adults. As expected of baby animals, they were extra super cute! "What's this hand thing anyway? One amazing thing was that the monkeys paid absolutely no attention to any of the humans around. They did not care about us at all and pretty much completely ignored us. That meant we could go right up close to them and they'd walk right by us. We might as well have been rocks to them- although they didn't go as far as to sit on us. I guess they were just used to all the people as there were fairly large group of people around the spring. While we were there was even one person with a huge TV type camera thing on a really big tripod. Those in the pool looked like they were enjoying themselves! "Tch tch tch, look at that lazy fellow"
There was some sort of monkey hierarchy and at one point the king called a meeting. All the monkeys streamed out of the pool and down from the hills and assembled around a monkey sitting on top of a pole. I have no idea what signal to gather was or what the meeting was about! We were hoping it wasn't anything sinister! After hundreds of photos and about half an hour at the pool with the monkeys we decided it was time to say goodbye and we returned to the entry building. We had a bit of a look inside and found a little shop as well as some information about the monkeys. I learnt some facts, such as how many monkeys were in the trope and what they eat, with the help of a fun quiz (in Japanese and English). The questions were on one side of a laminated sheet of paper which you flipped it over to reveal the answers. The next bus from the start of the path to the monkey park didn't leave for another hour so we had a pretty leisurely walk back through the forest. Since the next highway bus back to Nagano didn't arrive for ages we were actually planning to get a different local bus back to the nearest train station in the town of Yudanaka (湯田中 = Hot Water + Rice Field + Middle). From there we'd then catch a Nagano Electric Railway line train to Nagano and then transfer to a Tokyo bound shinkansen. We’d get off a couple of stops before Tokyo station though and have a look around Saitama. One last photo of the monkeys, Goodbye monkeys! All of this meant that we had to catch the bus from a different stop, Kanbayashi Onsen (上林温泉 = Above + Forest + Hot + Spring) rather than Kanbayashi Onsen-guchi. I was not one hundred percent sure if we had the right stop but happily after about twenty minutes the bus arrived right on time! The bus ride to Yudanaka was super slow! We really wanted it to hurry up as it was actually scheduled to arrive at the station a minute or two after the train was supposed to leave. If we didn't manage to get the next train we'd have an unfavourable transfer to a shinkansen which would result in us arriving at Saitama an hour and a half later. So we were like "come on, come on" as the bus meandered its way to and around the town. We even made sure we had the exact right amount bus fare ready so we could make a speedy exit. Since we didn’t know what amount it would come to we had to constantly update the amount we were holding as the bus fare displayed for ticket number changed. After a while though we gave up hope as the bus was running exactly on time and we decided they'd be no way we'd get there in time to board the train, let alone have enough time to buy tickets. I have no idea why the bus was not scheduled to arrive before the train left. Through some twist of fate though we managed to arrive at the station right at the same minute the train was due to leave!!! Our hope was restored and we somehow managed to pay our bus fair, jump off the bus while it was practically still moving and dash over to the platform where the train was getting ready to leave. Kate nearly got hit by a car as she flew across the road. The station was pretty small and there was just one platform. The doors on the train were just about to close when we arrived and we still didn't have a ticket! Luckily the station mater was there and he franticly gestured at us to get on, said we didn't need a ticket and gave us a slip of paper! Seconds later the doors shut and the train took off. Somehow we had made it! It took us about an hour to reach Nagano and at one point we all had to swap to a different train on the same line, as the first train had gone as far as it goes. 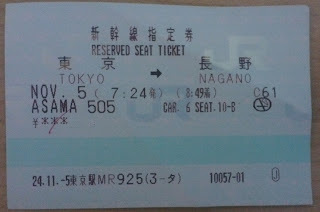 Upon arriving at Nagano we took our slip of paper to a station window and paid the ¥1,130 train fare. There were only a few minutes to spare before the next shinkansen left so we were rushing again and we hurried over to the JR section of the station. Since we hadn't had anything to eat since breakfast we stopped in at New Days on the way. Unusually for convenience stores the checkout lady was really slow serving us! Luckily though we were able get our food and make the train. We certainly didn’t have enough time to make a seat reservation so we just sat in the unreserved section where there was plenty of room. This is one of the very convenient features about the JR pass, without it we'd still have had to buy at least an unreserved ticket and would've have missed the train. We ate the food we had bought and had a nice journey back to Saitama. About half way through the trip Kate also bought a drink and some Toppo chocolate from the food cart lady. I procured some free Toppo from Kate. Saitama is a prefecture located to the north of Tokyo and as it is one of the locations where the people that work in Tokyo actually live and sleep, it is considered to one of the suburbs of Tokyo. We got off at Omiya Station which is the main station of the capital, Saitama City. There are a few attractions of interest around Saitama including a railway museum, prefectural museum, Hikawa Shrine and a bonsai village. Though I’d also like to see the railway museum Washinomiya shrine was the primary reason for us to want to visit Saitama. This shrine is one of the oldest in the Kanto region with records of its foundation dating back to the 2nd century BCE. 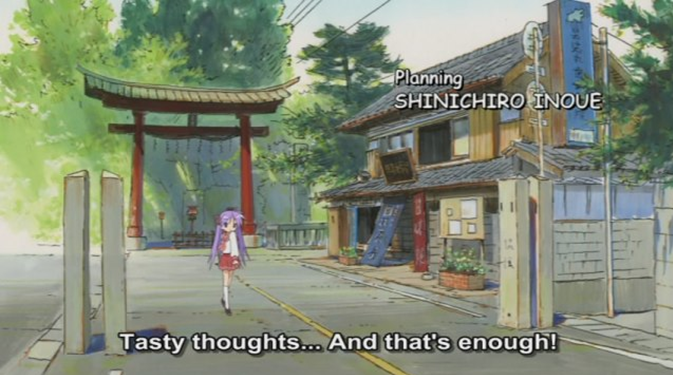 More recently speaking, the Washinomiya shrine was featured in the 2007 Lucky☆Star anime series. The show used many other locations around Saitama for its settings however as the shine is one of the easiest places to visit it has become somewhat of a focal point for fans with many people making the journey from Tokyo and beyond. The local residents of the town were at first baffled and apprehensive at the sudden influx of people with 130 000 visiting in 2007, 300 00 in 2008 and 420 000 in 2009. Eventually though the residents embraced the new visitors as their patronage bought some more prosperity to the town and it they thought it good for the shrine to have more worshippers, although the head of the shrine was worried they were worshipping the wrong deities. In 2008 the four fictional characters who worked at the shrine, Twin sisters Kagami and Tuskasa Hiiragi, and their parents, were officially registered as residents of the town. Washinomiya Shine is located near Washinomiya Station in the nearby city of Kuki and to get there from Omiya we needed to catch a train to Kuki Station from which we could transfer to a Tobu line train which would take us to our destination. Kuki is frequently served by Tobu line trains from Omiya although since we had the JR pass it was cheaper for us to get a JR train. The next JR train bound for Kuki didn't leave for about twenty minutes though, so we had a bit of a look at the many food shops at Omiya Station. I ended up buying some purin (pudding) as I have always wanted to try it- it always looks really good the TV shows. Unfortunately I didn't really like it much at all! Maybe I got a funny brand or flavour? Before long it was time to catch our train to Kuki and, after twenty minutes, we arrived at the station. Since we were no longer using JR lines we bought a ticket from one of the machines, transferred to the Tobu line and caught our train a few minutes later. Washinomiya is located only one stop from Kuki and we arrived after a short four minutes journey. It was very quiet at Washinomiya Station and there were barely any people around. There was a kind of lucky star float in the station building although as it was 2012 and had been around five years since it was made in 2007, it was a bit faded. We were not quite sure how to get to the shrine but thanks to Google maps on my phone and some instructions in the Japan Book, we managed to track it down. It's actually quite simple to get there; you take the east exit and follow the main road north east. After about 250 metres (3 minutes) you pass over a little creek and 100 metres after that the road veers north. After another 100 metres you'll reach some traffic lights and it is here you turn left. If you then follow this new road you'll reach the shrine after 200 metres. The total distance from the station is 650 meters and it takes about 8 minutes to walk all the way. Hanging from the lights along the side of the road there were flags that featured characters from Lucky Star, with the Hiiragi family featured in particular. As it was late afternoon it starting to get a little dark while we were there and, like the station, the town was very quiet. 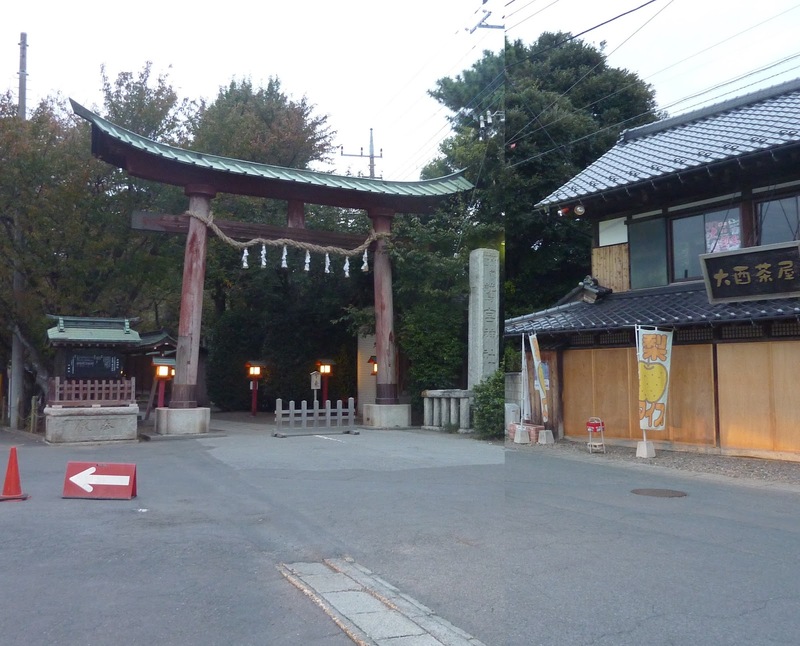 Once we arrived at the shrine we found it looked just like it did in the TV show! 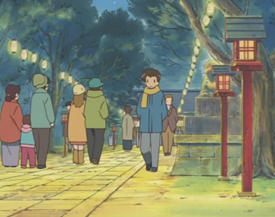 The best place to really see the comparison is at the entrance to the shine which had the torii gates and shop featured in the show’s opening song. For some reason we only took photos with us in them so I haven't got a complete shot, I had to cut myself out. Even so you can clearly see that it matches the drawing from the anime pretty well. While there was no one else in the shrine there were a few people in the car park and one of them had a Lucky Star themed itasha (痛車 = Pain + Car). This term is used for cars that have been outfitted, styled and painted by fans with characters from manga, anime and games. An increasing amount of Japan's official motorsport events have featured Itasha and a few have even managed to win races and championships. The practice is still seen as incredibly nerdy though. The people who owned the car were acting a bit stupid and loud so we didn't go over to have a closer look. return to a peaceful life. The shrine looked like it could become quite busy at times and had a large number of food stalls set up along the paths. While we were there though the stalls were all shut. We had a look around and took a few photos, at one point saw one of the religious people who worked at the shrine. My favourite part was the prayer block section where there was thousands of wooden prayer blocks that had been left by fans. Some of the drawings were very good and some truly devoted people had left a great many behind. There was one numbered set that had as many as 72 plaques! Since the blocks are periodically removed, out of that set only those from the late 60's early 70's were visible. I’ve often wondered what the shrines actually do with all those blocks. I had a fun time looking at many of the plaques and have included some of the photos I took of them below. It's four in the morning, Wedding ceremony. There's a chance? "Happy birthday Minami-Chan" at the top. Both are from a "Colin"
- It would be good if there was one"
and hoped that Orihima and Hikoboshi (Altair) would meet. When we were done with the woodblocks and shrine we headed back to the station. Along the way there were a few shops that sold Lucky Star merchandise although I was too embarrassed/shy to go inside and have a look, so I just looked from outside. Once back at the station we bought a tick and waited for the train. When it was time to transfer back to the JR lines at Kuki Station we accidently went the wrong way though some ticket barriers. After putting our ticket in the machine a red cross came up and the gates shut to block us. We were actually moving so fast through that we kind of popped through the gates to the other side anyway. We must’ve looked pretty confused as a school girl came over and told us in Japanese that the gates were entry only. Right after she said that I realised that there was a voice announcement over the gates saying the same thing. Since we were already through, our train was coming and we had paid for a ticket we didn't worry about trying to go back through and around to the entrance gates. This didn’t stop Kate from worrying during the trip to Omiya that we were going to somehow get arrested. On the trains back to Omiya there were lots of middle and high school children, for some reason the majority of them were girls and there were not many boys. There were plenty of salary men though- maybe there was an all-girls school in the vicinity? Since it was nearly dinner time Kate got some Sushi from one of the food shops at Omiya. I wasn't feeling too hungry though and decided to wait until we got back to Tokyo. To get from Omiya to Tokyo it’s usually a bad idea to get the shinkansen as it's much more expensive and due to urban speed restrictions it’s not much quicker. We caught one though as it was free with the JR pass and there was one conveniently about to leave when we wanted to depart. A regular Japanese business man hopped on the train with us and I wondered what his reasons were, maybe the company was paying? Once we got back to Tokyo we went back to our hotel at Hatchobori and had a bit of a rest. Later in the night I was feeling hungry and we went out to have a look for some food in the nearby area. 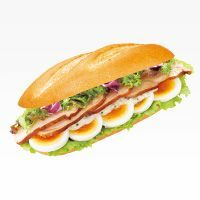 I ended up getting a Chicken & half-boiled egg Milano sandwich C from Doutor, which is coffee shop chain found absolutely everywhere all over Japan. It was a little smoky inside, but not too bad. On the way back to our hotel we came across a 24 hour grocery store. Although it wasn’t as big as a full supermarket it was much bigger than a convenience store and looked to have a good selection of item. They even had some Winnie the pooh flavoured cereal that Kate really enjoys. As a desert I bought a packet of peanut m&m's and we returned back to the hotel. Since it forecast to be rainy we made the following day a kind of shopping day. We visited Nakano and Akihabara and I bought a massive stack of books!